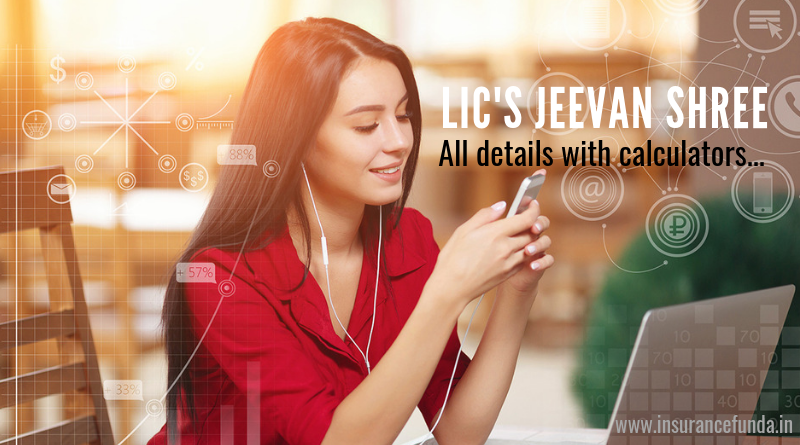 Jeevan Shree (Plan No 112) was the first plan specially introduced by LIC of India to cater to the needs of the high-income segment of the market. Jeevan Shree is a limited payment Endowment Assurance plan with a guaranteed addition of Rs 75 per 1000 Sum Assured and a minimum Sum Assured of Rs. 5,00,000. Jeevan Shree was introduced on 16/01/1995 and withdrawn on 01/02/2002. Hence it is no more available for sale. Here at InsuranceFunda, we get a lot of queries about this plan. This article will help you to understand all its details. Calculators provided in this article can help you to understand the maturity benefit, insurance coverage and other details of the plan. Limited payment endowment assurance plan. Guaranteed Additions of Rs 75 per 1000 Sum Assured. If at least 5 full years premiums have been paid, the policy will become eligible for ‘Loyalty Additions’ along with the maturity benefit. Additional Accidental Death Coverage(DAB) and Extended Permanent Disability Benefit(EPDB) is not available but permanent disability benefit (of the first Rs.20000 on all policies held together) is available. The policy will acquire special surrender value after completion of even a single policy year, provided the premiums have been paid for at least 1/10th of premium paying term. Generally, endowment plans are ‘with profit’ plans and profit is shared by bonuses declared and added to the policy account every year. Eventhough Jeevan Shree is an endowment plan it does not have bonuses. Instead Guaranteed additions @ 75 per 1000 Sum Assured is added to the policy every year. The policy shall be entitled to receive loyalty additions as declared by the corporation from time to time at the time of exit (by way of maturity or death) as a one-time payment. Loyalty addition will depend on completed in force years of the policy as on the date of maturity or date of death. No loyalty addition shall be payable in the event of policy being surrendered or discounted or made paid up. Latest Loyalty additions rates of Jeevan shree plan 112 is given below. Jeevan Shree (Plan 112) – Online calculator can help you to understand all the benefits of the plan easily. Enter your details such as sum assured, term, premium paying term and age to get all the details of the plan. Let us consider an example of person who have taken a Jeevan Shree policy. Let the details of the person be as follows. Maturity benefit of the policy includes the Sum Assured + Guaranteed additions at the rate of 75 per 1000 Sum Assured + Loyalty Additions. As per the latest bonus rates declared by LIC of India Loyalty additions for the 25 Year term is Rs 1300 per 1000 Sum Assured. Guaranteed Additions per year shall be 37500. The Maturity benefit and the premium of the policy shall be as shown below. Other benefits of the plan like insurance coverage and total premium paid can be understood from the illustration given below. ← Traveling to USA – How to get a health insurance plan.